Less than six months after the LG G6 was unveiled at the MWC 2017, Sprint was selling the phone at a whopping discount of $588. With this move, it meant that Americans using Sprint or willing to join the carrier were only required to part with $120 spread over a period of 24 months with a monthly payment of just $5. This was insane for a phone that was considered a flagship, but for sure, it was down to one major reason. Looking at the design and features of the LG G6, you’ll agree that it sits in the same group as other 2017 flagship phones. However, following its early release at the MWC 2017, it meant that the G6 could not get the flagship processor of the year – the Snapdragon 835. At the time, the chipset wasn’t ready for shipping and LG felt that waiting will distort its course. Well, how wrong it was! LG wasn’t the only OEM that made this mistake of shipping a 2017 flagship phone with a 2016 flagship chipset. Before the LG G6 was announced, HTC had already unveiled the U Ultra priced at a whopping $749, but as at the time of this writing, you can get it for as little as $330 on Amazon. Like the G6, the HTC U Ultra also did one major mistake of shipping with the Snapdragon 821 SoC, but the rest of the specs were flagship level. At the same event as the LG G6, Sony also did a similar mistake by unveiling the Xperia XZs powered by an even older Snapdragon 820 SoC. The phone was announced alongside the Xperia XZ Premium, but the latter came with the newer Snapdragon 835. At launch, the Xperia XZs came with a price tag of $699 and not long after, the phone received a $100 discount. This was simply the beginning of Sony realizing its mistake because as of now, the Xperia XZs is much cheaper having been discounted even further. 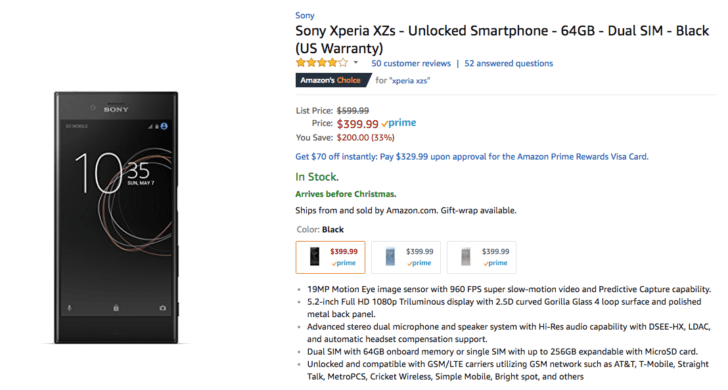 You can grab the Xperia XZs at just $399.99 on Amazon, which $300 off the original selling price and $200 off the previous price of $599.99. The Xperia XZs started selling in April 2017, which makes it less than a year, but during the short period of its existence, the phone’s price is already less by 50%. Like the LG G6 and HTC U Ultra, the Xperia XZs is a great piece of hardware, but it was never going to sell at $699.99 yet on the inside is an old Snapdragon 820 processor. Right now, grabbing the Xperia XZs at $399.99 might just be the perfect deal. For this price tag, you get a 5.2-inch 1080p display screen, 4GB RAM, 64GB of expandable storage, a 19MP “Motion Eye” lens on the main camera that can shoot up to 960fps slow motion videos, a 13MP selfie shooter and a 2900mAh battery unit with support for fast charging via a USB-C port. To further justify its flagship status, Sony went ahead and included an IP68 design, but as usual with U.S. variants, the fingerprint scanner has been deactivated. The phone is available in all three color variants of Warm Sliver, Black and Ice Blue. Sony is expected to refresh the Xperia XZ1 family at the MWC 2018, where expectations are high that there will be a new Xperia XZ1s and probably Xperia XZ1 Premium. So far, it seems Sony has learnt a few lessons from its past mistake, where leaked specs of the alleged Xperia XZ1s show that the phone will be powered by the 2018 flagship chipset – the Snapdragon 845.